Rent Sky Room | Corporate Events | Wedding Locations, Event Spaces and Party Venues. The Sky Room places you in the heart of the city with views of the Empire State Building and the Hudson River from the 33rd and 34th floors of the Fairfield Inn & Suites Times Square. 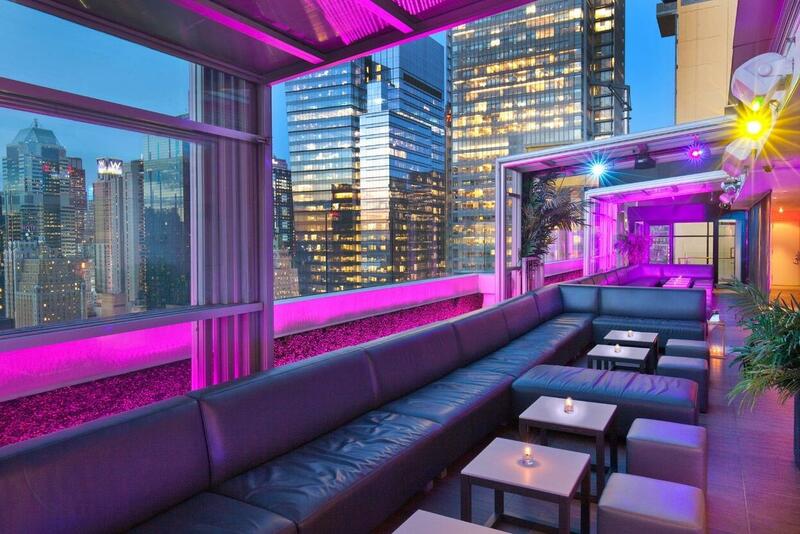 One of the city’s highest rooftop lounges, it takes New York City nightlife to the next level. The panoramic glass walls and fully retractable roof of this unique space allow the party to continue through every season, and in any weather. Enjoy live DJ’s and the most engaging drink menu in midtown while surrounding yourself with the most amazing views that Manhattan has to offer in Sky Room’s North Terrace. The South Terrace of the Sky Room includes the intimacy of private cabanas to allow guests to immerse themselves in nightlife while they get lost in conversation with friends. This section of our famed rooftop lounge pulls the eclectic and exhilarating pulse of the city right into the room, adding to the high-energy atmosphere of Sky Room. If you’re searching for the perfect setting to immerse yourself in New York nightlife, you’ll love every detail of this beautiful and engaging extension of the Manhattan lifestyle. The Cube Balcony is the perfect space for those looking to combine a high energy nightclub with a upscale rooftop ultra-lounge. The Sky Room’s Candlelight Lounge brings the perfect contrast of subdued intimacy to the high energy party scene of the exterior spaces in this dynamic nightlife venue.